Human PTGES. BLAST analysis of the peptide immunogen showed no homology with other human proteins. Synthetic 13 amino acid peptide from 1st cytoplasmic domain of human PTGES. 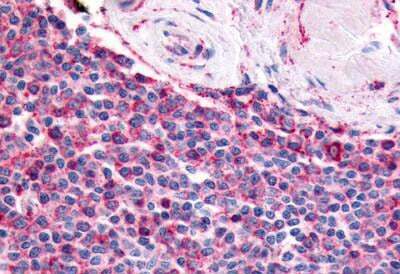 PGES / PTGES antibody was raised against synthetic 13 amino acid peptide from 1st cytoplasmic domain of human PTGES. Percent identity with other species by BLAST analysis: Human, Gorilla, Gibbon, Monkey, Rabbit (100%); Marmoset, Dog, Elephant, Panda, Pike (92%); Bovine, Hamster, Pig, Xenopus (85%). Small volumes of anti-PGES antibody vial(s) may occasionally become entrapped in the seal of the product vial during shipment and storage. If necessary, briefly centrifuge the vial on a tabletop centrifuge to dislodge any liquid in the container`s cap. Certain products may require to ship with dry ice and additional dry ice fee may apply. Prostaglandin E Synthase (PGES) is a membrane associated protein involved in eicosanoid and glutathione metabolism as part of the arachidonic acid signaling pathway. The expression of PGES is induced by the proinflammatory cytokine IL-1B and its activity is glutathione dependent. 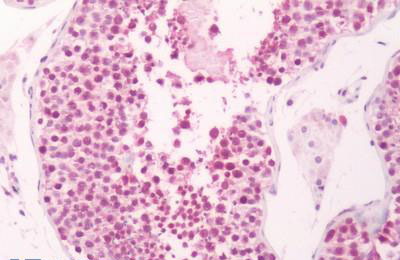 PGES is also expressed at high levels in P53 expressing cells. 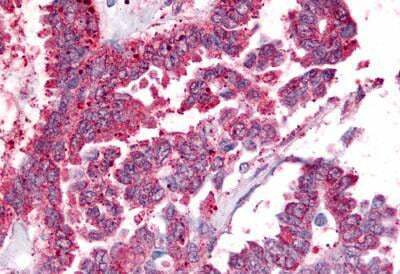 Anti-PGES / PTGES antibody IHC of human Ovary, Carcinoma. Immunohistochemistry of formalin-fixed, paraffin-embedded tissue after heat-induced antigen retrieval. 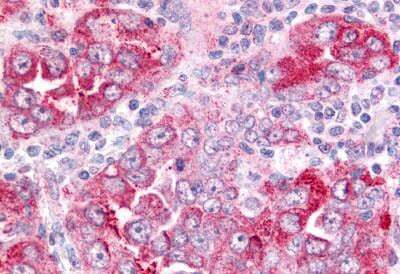 Anti-PGES / PTGES antibody IHC of human spleen. Immunohistochemistry of formalin-fixed, paraffin-embedded tissue after heat-induced antigen retrieval. 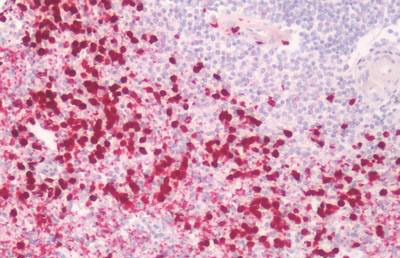 Anti-PGES / PTGES antibody IHC of human Lung, Non-Small Cell Carcinoma. Immunohistochemistry of formalin-fixed, paraffin-embedded tissue after heat-induced antigen retrieval. NCBI/Uniprot data below describe general gene information for PGES. It may not necessarily be applicable to this product. PTGES: Catalyzes the oxidoreduction of prostaglandin endoperoxide H2 (PGH2) to prostaglandin E2 (PGE2). Belongs to the MAPEG family. 1. Data indicate that the Tibetan prolyl hydroxylase domain protein 2 (PHD2) haplotype (D4E/C127S) strikingly diminishes the interaction of PHD2 with heat shock protein 90 co-chaperone protein p23 (prostaglandin E synthase).